Lord Shuttleworth has visited Laila’s Fine Foods, as the company continues to grow and boost the local economy. Lord Shuttleworth has served as chairman of the Association of Lord-Lieutenants since 2008 and was a Member of the Council of the Duchy of Lancaster from 1998-2014 as well as serving as Chairman of the Council from January 2006 until December 2014. He was made a Knight Commander of the Royal Victorian Order (KCVO) in the 2011 New Year Honours, in addition to being a Knight of St John (KJStJ), and in June 2016 he was appointed by The Queen as a Knight Companion of the Most Noble Order of the Garter. His visit was to inspect the Laila’s recently expanded 96,000ft² premises in Bispham. The investment in the expanded manufacturing facility follows the company’s year-on-year growth over the last six years. Its workforce has also grown by more than 100% in the past four years to over 430 employees. Lord Shuttleworth was welcomed to the facilities by Directors, the Remtulla family, managers from within the business and the local media. 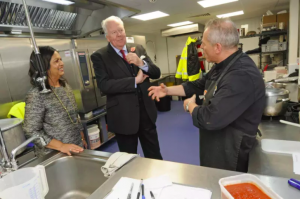 The visit began with a short presentation outlining Laila’s Fine Foods growth journey from just 47 employees when the firm moved to the factory on Moor Park Avenue in 2007 to its current 430 employees and £36 million turnover in 2016. There was also details of the manufacturer’s capital investment that the business has made to support future growth plans to enable them to continue to develop the business from their Bispham site. The visit then continued with a tour of the facilities, following the production process, from the development and cooking of the meals, through to portioning of the completed meal. Lord Shuttleworth showed great interest in the traditional cooking techniques Laila’s Fine Foods uses to ensure an authentic, home-cooked taste without using any artificial colours or preservatives.